Throughout its 40 years of history, Sangbo's CMS(Coating & Material Science) Business Unit has sought to apply nano technology in the field of coating through continuous R&D, successfully developing various high-performance and special purpose window films, exported to over 60 countries. 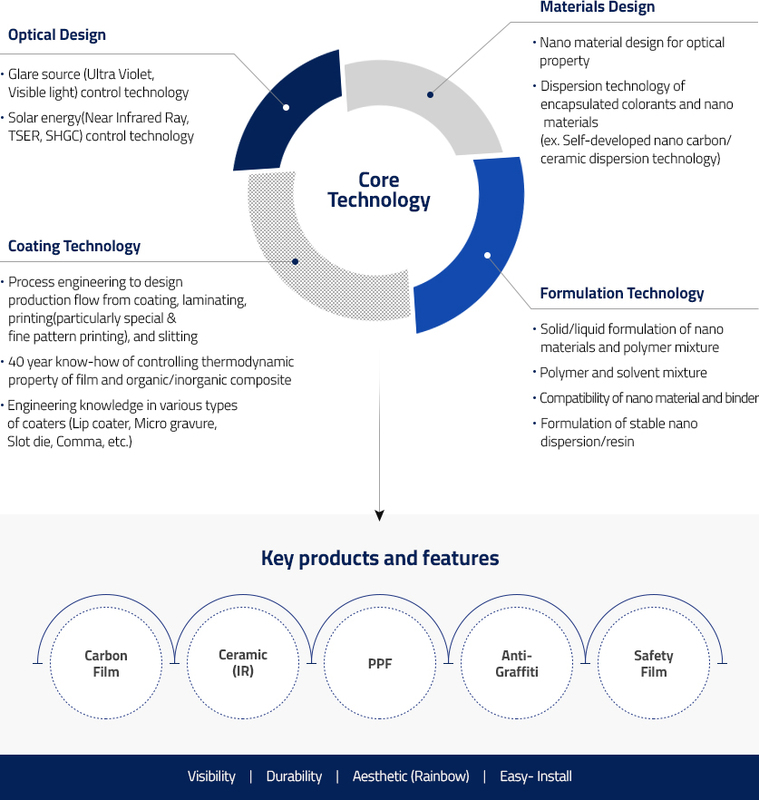 CMS BU's four primary technologies - optical design, materials design, formulation technology, and coating technolog - are the results of proactive investment and R&D in coating and material technologies. CMS BU's core technology of materials design and formulation, allows it to produce the industry's top nano coated films with outstanding heat rejection, superb visibility, longevity, and easy installation. Meanwhile, Sangbo's production facility has evolved over the past 40 years, building on its know-how and in-depth understanding in coating and converting technology. Sangbo offers the most technologically advanced window film manufacturing facility in the industry, owing to its continuous research on advanced coating methodologies and machinery. Sangbo's technological strengths have empowered the company to offer the industry's best high-performance films that guarantee efficiency, productivity, stability, and quality. Sangbo is the world's leading provider of qualified window films, paint protection films, safety films, exterior films, and anti-graffiti films. Sangbo's functional architectural window films are highly recognized for their non-discoloration durability, energy savings and superior performance. As such, Sangbo's highly referenced and best-quality products are used in airports, hotels, shopping malls, banks, and other landmarks around the world. Sangbo's automotive window film is distinguished for its clarity, heat control performance, longevity, and easy installation. Sangbo supplies its automotive window film products to globally known window film brands as ODM. Sangbo's paint protection film offers the industry's most advanced gloss, self-healing, hydrophobic, anti-fouling, and solvent resistant properties, enabled through its superior top coating technology. It also provides excellent elongation and easy installation with its premium non-yellowing TPU and advanced adhesive technology. The excellence and potential of Sangbo's PPF products have been proven through ODM references of major global PPF brand companies. The CMS BU at Sangbo consists of Research & Development, Marketing, Hyper-Customizing Production System, Systemized Quality Control, and Packaging and Delivery departments, all organically integrated to meet customer needs in technology and products. copyright 2017 sangbo. all rights reserved.